Fire Tiger Tooth Black Label multipurpose blade with electroplated core for cutting wood, plastic, steel, concrete, masonry and ductile pipe. The Fire Tiger Tooth diamond blade is engineered for use by Fire Fighters, Rescue, USAR, S.W.A.T. and Police. Applications include utilization as an Emergency Rescue Blade and Tactical Entry Tool. MK Diamond's new Vacuum Brazed Technology is the secret to the Fire Tiger Tooth’s effectiveness. Diamond particles are fused directly to the steel core creating the strongest heat resistant bond available when cutting without water cooling. Available in the most popular sizes, the Fire Tiger Tooth can be employed on hand-held grinders, circular saws,chop saws and gas cutoff saws. 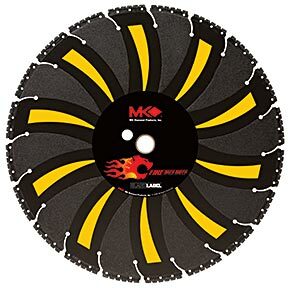 Outlasting abrasive cutting discs 100 to 1, the Fire Tiger Tooth is not only time saving but a cost effective cutting solution.Click here to download the Fire Tiger Tooth Blade Safety Instruction Manual. As a part of the System Assessment and Validation for Emergency Responders (SAVER) Program, Texas A&M Engineering, including Texas Engineering Extension Service (TEEX) and Texas Transportation Institute (TTI), conducted a comparative assessment of multipurpose cutoff saw blades. The MK Diamond Fire Tiger Tooth blade rated highest of all blades tested. The findings are presented in the Multipurpose Cutoff Saw Blades Assessment Overview, which can be accessed at this link.